So many times have I wanted to type in this white space with all these formatting buttons and transliteration options and with links to preview, edit and compose only to be held back by the unconditional trauma of having have to choose a title, perhaps akin to what some film makers go through when they come across the all important process of having have to name their characters. Which is why out of sheer boredom or perhaps, the tiredness of the aforementioned process of having have to come up with a spine-tingling name, the very same ones that have been given to heroes and heroines outstandingly long periods of time, get chosen. Rahul, Raj, Tina, Priya, Karthik. The naming bit I have already written about has apparently led to some crazily demented inferences on what the supposed 'underlying thought' could have been with the name. So many people in this world have so much time. Time that I wish I could add to my day, if only that were ever possible. Like clouds that meander in to a clear blue sky, thoughts tip toe into a mind that is already crowded with all the somethings, everythings and nothings of the world that I have willingly or unwillingly procreated. Some thoughts do have to tip toe I guess, some really good ones can only do that with all the everything that is happening around, maybe like a child that totters into a room full of self consumed adults talking about what exactly is going wrong with the politics of the state only to come to the conclusion, like every conversation that takes place in dining rooms and drawing rooms, coffee houses and tea tables, that its all going to the dogs and nothing can be done. And another time it resurfaces when there is an apparent calm with everything else maybe because the everything else decides to take an afternoon siesta. Right now I am so bitten by the travel bug. I really wish I could get out of here and out there, somewhere, anywhere. Escape almost. For a while. I keep romancing the concept of silence and serenity. So perhaps someplace like that. Sometimes I get into a divine romance. Of romancing spirituality and living a life of austerity. Maybe not of austerity. But definitely out there in the mountains and being where I am constantly in a state of joy, where the weather and everything else will have no effect on me. Nothing can change me. But of course the path I have chosen is quite diametrically opposite to all that. Nothing wrong here. I am OK. But at times it is like a beautiful day dream I conjure up. A beautiful escapade it would be. Actually its lovely this life, my life, without much attachment to as many things as most average people have. I could probably need only my hand digits to count, maybe only those on my left hand, to count out the number of people/things that I am attached to. A lot of people don't have that sort of freedom. So many are so weighed down. And I see most people are not in control of their own lives. They have so many people to ask starting from family to workplace to a lot of other things before they even plan a trip somewhere. Hmm. The only down thing of living in the mountains far far away is that I cannot get my baking supplies. Which is now my new found love .. hehe. Anyway I have been reading this book, Eat Pray Love. And you should absolutely read it. Its quite wonderful. And yes, if you can, do read. And do travel. Any Book. Any place. With me, names have never be a problem! I consider my blog posts as my children.. (brain-child).. So you always wish to have the best name for your child! Isn't it? It finally ends up as the post's name forever.. just like our names- chosen by our parents..
My dad, I have heard, had chosen a list of 12 names for me.. Mathangi was in it too.. (It's name that comes in this sanskrit shlok "shyamaladandakam").. Others were gauri/Geetha/Sangeetha,Poorani(coz my dad loved this book 'kurinji malar'.. lead charac. in tht book.. was Poorani) so mom thought Mathangi is the uncommon one.. not many people have tht name.. So i am now mathangi! I didn't have a choice there! But you always have a choice on u'r posts.. You are so creative! You write Brilliant stuff! I am actually little surprised that "Names" are such a big problem for you..! But again, you can always take a leaf out of Sujatha's work "Marakappal"!!! In that, a friend is a book worm who wants to create a story of his own.. He creates this plot, sitting in a library.. his other friend comes in.. n he adds in a few things.. n thus, both of the discuss.. talk.. plot.. finally they come up with this bizarre story.. Actually the whole "Marakappal" is about these two guys creating a story.. Finally, both of them are confused about wht to name it? A third friend enters the scene.. This main guy.. all of a sudden.. as soon as third guy enters, asks him- "We have written a story.. what to name it"? third guy, doesnt stop to ask even wht s the story bt.. he just answers tht question- "Marakappal"! Ta-Daaa!!! You must try this! :D It would just be so much fun!! Hey.... Sorry.. on second thoughts, I dont think "Marakappal" was Sujatha's.. I forgot who the author was! chinmayi .. title tells the reader the synopsis of the post ..what ever u write in pages can be said in a world or two .. try it .. its just another interesting thing and wont be tied ..
ah ha. reading Eat Pray love, did this to me too, conjuring up images, day dreams, longing for serenity and silence, wishing to have a bit more divine awakening, immensly enjoyed it, and glad you are enjoying it too. i am a big big fan of yours ! i love your songs and especially your voice ! I thought of suggesting u a name for your blog ! 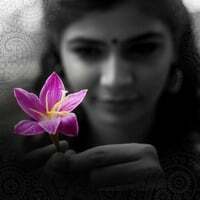 Why not Chinmayi's World Itself ?